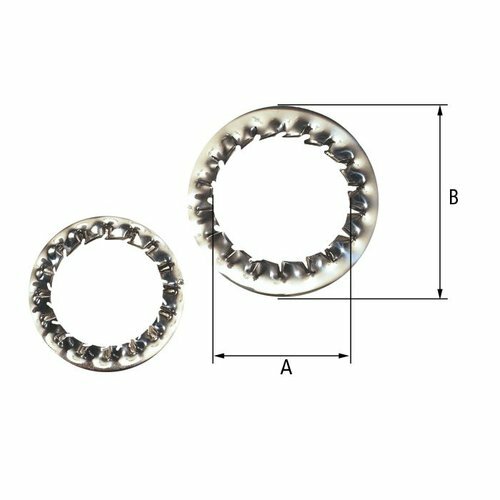 Available in Stainless Steel, these ‘shake-proof’ Serrated Washers are fitted internally to the equipment before a locknut and act as an anti-vibration device to prevent the Cable Gland or accessory from inadvertently loosening in service. Self-loosening should be avoided according to clause 6.4.1 of IEC 60079-14, this can occur through relative motion over time even without vibration, due to differential thermal effects caused as a result of either differences in temperature or differences in clamped materials. Metric Ordering Reference (Stainless Steel) Reference Diameter "A" Minimum Thickness External Diameter "B" NPT Ordering Reference (Stainless Steel) Reference Diameter "A" Minimum Thickness External Diameter "B"
Metric Ordering Reference (Stainless Steel) Reference Diameter "A" Minimum Thickness External Diameter "B" NPT Ordering Reference (Stainless Steel) Reference Diameter "A" Minimum Thickness External Diameter "B"